This entry was posted in Drones and tagged Drones on November 2, 2015 by Grandtrines. he first “commercial beyond visual line of sight operation with an unmanned aerial system (UAS)” has just taken place. The event marks a new series of efforts to enhance railway safety and infrastructure inspection. Insitu and BNSF officials launch ScanEagle for the historic first flight. 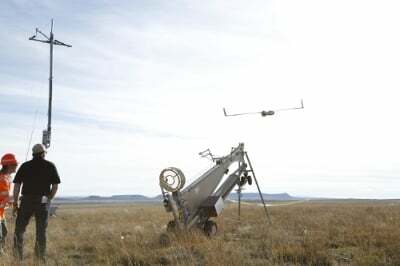 Insitu, a provider of information for superior decision making, developed the unmanned aircraft that was launched from a tower site in New Mexico as part of the U.S. Federal Aviation Administration’s (FAA’s) Pathfinder program, an initiative to develop UAS regulations. In its first day of operations, ScanEagle provided real-time video covering 64 miles of the 132-mile stretch of track BNSF has designated for the exercise. ScanEagle is capable of flying for up to 24 hours at speeds of up to 80 knots. This entry was posted in Drones and tagged Drones on October 31, 2015 by Grandtrines. You may have seen in the news recently that drone users may have to start registering their aircrafts with the Federal Government. This includes the remote controlled, relatively small crafts for recreational use. The FAA (Federal Aviation Administration) said this about the issue: “Flying unmanned aircraft in violation of the Federal Aviation Regulations is illegal and can be dangerous,” FAA Administrator Michael Huerta said earlier this month. “We have the safest airspace in the world, and everyone who uses it must understand and observe our comprehensive set of rules and regulations.” The FAA proposed a 1.9 million dollar fine to an aerial photography firm that took pictures above New York and Chicago. With all the hoopla surrounding this, we decided to take a look at some of the weirdest, craziest, insert whatever adjective you want, arrests having to do with drones in recent history. This entry was posted in Drones, Law, Legal and tagged Drones, Law, Legal on October 31, 2015 by Grandtrines. A judge has dismissed all charges against a Kentucky man who was cited for criminal mischief and wanton endangerment after he shot down a drone over his property. Witnesses said that the drone was seen below the tree line, which Judge Rebecca Ward ruled was in violation of William Merideth’s privacy. This entry was posted in Drones, Law, Legal and tagged Drones, Law, Legal on October 29, 2015 by Grandtrines. I’m an avid fan of both quadcopters and startup pitch TV show “Shark Tank,” so when the two came together last week, I was eager to see the outcome. I never expected a feeding a frenzy. All five “sharks” took a stake in xCraft, a company with one drone in production, the X PlusOne, and another now on Kickstarter, the PhoneDrone Ethos. If you’re curious about the latter, it’s exactly what it sounds like: a drone manned by your phone. It doesn’t use your phone as a controller, mind you, but rather sends your actual phone skyward, using its guts for aerial glory. This entry was posted in Drones and tagged Drones on October 28, 2015 by Grandtrines.